The inspiration for this image came from the subject I chose to photograph. I decided to photograph hockey in Flagstaff. 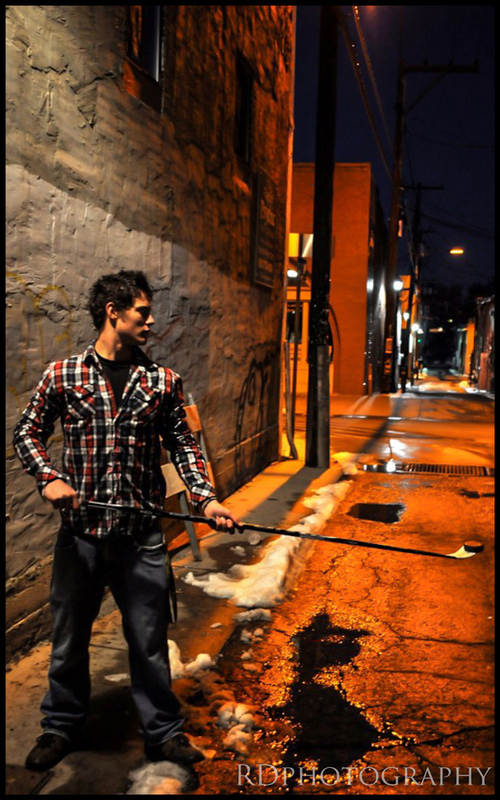 I had a number of different ideas that I wanted to shoot, however, the idea that stood out most in my head was to photograph a hockey player, a native of Flagstaff, in a downtown Flagstaff environment. I wanted to create an image that many hockey players, especially those native to Flagstaff, could understand and appreciate. Every hockey player growing up is raised with a hockey stick and a puck or ball but at some point doesn’t quite know how to skate. Hockey players learn to hone and develop their skills on the streets with nothing but a stick and a puck. With this image I wanted to depict just that and I felt as if the alley was a perfect choice. I shot the subject downtown at night because I really liked the effect it created in the photo. The harsh shadows and the emphasis the lighting placed on the subject really stood out to me. It gave the image a dramatic feeling and really helped to emphasize the environment around the subject. By looking at the image there is no doubt that the subject is standing in an alley. This also reminded me of one of my favorite childhood movies “The Mighty Ducks.” One of the main characters in the film is discovered shooting pucks in an alley with nothing but a stick. The character is later introduced to the ice for the first time where he ends up becoming a valuable player to the team. Again it continues with this idea that all players begin by shooting pucks and developing their skills off the ice and on the street. This image was shot with a Nikon D5000 camera and a 55mm lens. I shot this image with an ISO of 400, an aperture of f4.5 and a shutter speed of 1/3. This photograph is one of my earlier photos, however it was definitely a photo that helped to spark my interest in photography. For post-processing techniques, I used Photoshop Lightroom to lighten the exposure to get rid of some of the harsh shadows throughout the photo. My name is Anthony DeAngelo, although I go by the name Rocky. It is a name I have gone by ever since kindergarten and a name I plan to have changed legally. I was born in Salt Lake City, Utah but was raised in Minnetonka, Minnesota and moved to Arizona five years ago. My childhood in Minnesota helped to shape who I am as a person and why I ended up at Northern Arizona University. If it weren’t for my love of the outdoors and winter I would have probably ended up at Arizona State University. As far as photography goes I would say I am just starting out and just dabbling for the fun of it. I chose photography as a minor because I felt that it would be a great accent with my advertising degree. However I really learned to appreciate the art of photography and found that I love to shoot everyday things as well as difficult things, like my favorite subject, hockey. As a player for the NAU IceJacks I have access to many things that not all sports photographers have access to. A lot of the images I take are all images that I have taken while wearing skates in the middle of practice. By having this privilege I feel like I can capture many fascinating and difficult images that not many others can. I also feel like this helps to separate me from other photographers my age. I would say that my goal as a photographer hasn’t quite manifested into a professional one however with time and experience I’m starting to consider and believe it is something that I could possibly pursue when I graduate. Gritty… great lighting, great exposure control, nice depth of field.. I’m particularly drawn to the light on the blade of the stick drawing attention to the puck.. compelling sense of mystery and intrigue.. even after you explained the background, I look at the image and think “why”… my only objection (and I had to look at the shot several times before it bothered me) is the caution barricade leaning against the wall behind the subject.. that would only bother me if I framed and hung this photo where I would be looking at it frequently..
all in all a great evocative image..